The stage directions for what has become known as one of the most powerfully moving scenes ever to grace our TV screens. The final stage directions for the last ever episode of the Blackadder comedy series. We see a slow motion shot of Captain Blackadder and the rest of his company going over the top. The theme tune hauntingly plays on a piano. Explosions around them. The soldiers disappear into a Flanders field as the colour fades away. Hesitantly, colour returns until we see before us a field of vibrant red. Poppies. This image of the poppy continues to speak powerfully to us today. The poppy has become iconic. Speaking across the generations of sacrifice and remembrance. I stand before you today nervous and a little unsure while feeling quite inadequate in this task of speaking to you during this service of remembrance. I’m 45, have a wife and 3 children, exist fairly comfortably and like to think I know a bit about life! I am conscious that some of you here today may only be half my age and yet you have experienced many things that I cannot even begin to imagine, and if I am honest – nor do I want to! You people of our armed forces present today are brave people who have chosen to serve this country so that others, civilians like me, can live in peace and be protected from the horror of war. I remember in my teenage years how war was glorified by those like Hollywood giving the impression that war was full of heroics and victory. Then the Falklands War happened. I was living in Weymouth at the time and waved off a good friend Richard who had joined up 4 years earlier. Rich survived the Sir Galahad and when I met him it was clear something had changed. Looking into his eyes something was different, something was missing. Maybe some part of him had even died. As we talked it was clear he was hiding stuff, to protect us from the horror. The Hollywood image disappeared. There are no words, there are no anecdotes … there is simply nothing that can take away the horror of war which has resulted in the death of your friends, your family members, civilians caught up in war zones and yes the deaths of those you have fought who are sons, daughters, mothers, fathers and friends of different people. I am struck by our iconic symbol of this day. In this cathedral you can see 2 icons before you. The thing I love about icons is that the longer you look, the more you see. Icons have layers and layers of meaning. To the casual observer these depths of meaning can be missed. If I were to ask you what a poppy symbolised you would probably say ‘remembrance’. There are two other iconic layers I wish to draw your attention to. The poppy is the source of opium. A powerful pain killing drug. The poppy speaks of the pain of the memory but also of the desire for the pain to be taken away. Just for a little while. As much as we may want that, we also know it does not help us or the rest of society if we try to escape the reality of pain. We live with the scars. Knowing that irrespective of whether those scars are from the wounds of missing loved ones or from the actual things we have experienced during war – both massively hurt! We face up to the pain which Remembrance day helps us to do. There is another iconic layer of meaning of the poppy. This meaning has its roots in the Greek and Roman times. It comes from the knowledge that poppies bloom every spring. The redness of the poppy, which would be seen without exception every year, seen as a promise of hope and resurrection. In those Flanders trenches, the poppy flowering each year with the coming of the warmer weather, brought life; it brought hope and colour to that war torn landscape. Red as the colour of hope. Nearly 100 years later the icon of the poppy can continue to be a symbol of hope. A promise of new life. That gives us hope. Faith in the resurrected Christ does not draw out the ‘if’ question but the ‘when.’ When will this happen? There is a certainty there! This is not a faith that talks of being whisked to heaven where everything is ‘fluffy’ and nice. The choir the anthem sang are words from Revelation. These words tell us what will happen. There will be a new earth, and God will live with us and wipe away the pain. There will be no more death, no more sorrow, no more crying, no more pain. Today we can remember that we have that hope of a new world here on earth. 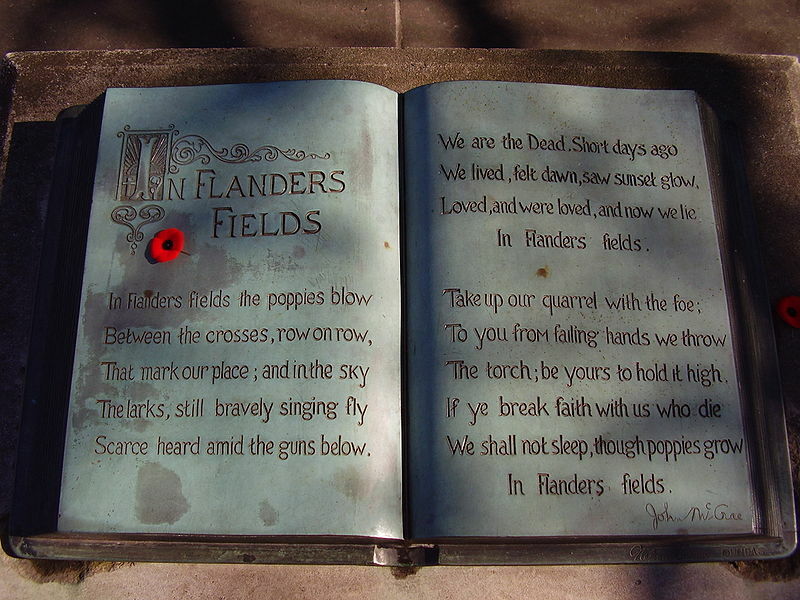 McCrae’s poppies symbolise the war dead. From the blood they shed on the battlefield, seeds germinated, sprouted, and grew into beautiful red flowers that inspired and heartened the living. The poppy … an iconic sign of remembrance and hope – may we (are we able to) let it continue to inspire and hearten us today? This entry was posted in church, death, remembrance by robryan65. Bookmark the permalink.